I like Costume National clothes, but their perfumes haven’t thrilled me. When I read last year’s announcements regarding Costume National’s new men’s fragrance, Homme, I wasn’t excited and didn’t bother to order a sample of the perfume. As often happens in the fragrance world, others took it upon themselves to send me little vials of Homme, and I’m glad they did. 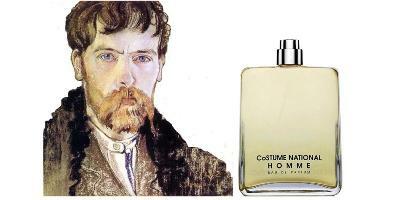 Homme, created by perfumer Dominique Ropion, is a close relative of Comme des Garçons Series 3, Incense fragrances (woody/resinous with sweet/spicy facets) and it’s practically a “twin” of Eau d'Italie Baume du Doge. Homme includes notes of grapefruit, bergamot, cardamom, cinnamon, thyme, clove, patchouli, sandalwood and labdanum. Costume National Homme is a well-blended fragrance; the opening is a bit liquor-y with dense citrus melding quickly with spices: cardamom at first, then clove, cinnamon and dried thyme. I am not a fan of many clove/cinnamon scents; any perfume that smells overwhelmingly of clove/carnations or Red Hots will annoy and, for some reason yet to be figured out, depress me. Thankfully, the cinnamon/clove in Homme is dry, verging on ‘woody’; it’s as if the spices had been stored too long in a wooden box and had solidified or were absorbed into the wood itself. Aged or, if you prefer, “faded” spice notes can be interesting, and comforting. Homme’s spice notes never fade away but as the fragrance dries down, the scents of patchouli, cedar/sandalwood and leather-lite become apparent. The extreme dry-down of Homme smells of soft, plush, and lightly spiced amber. At the moment, I’m wavering between buying a full bottle of Homme or Baume du Doge; I’ll wear the scents side by side and decide which one will join the household come autumn. Costume National Homme Eau de Parfum has good sillage and excellent lasting power; Homme is $80 for 50 ml. For buying information, see the listing for Costume National under Perfume Houses. Note: top left image is Self Portrait by Stanislaw Wyspianski [cropped] via Wikimedia. I absolutely love this and feel the same way: “I’ve always loved the smells of dusty attics, the insides of old trunks and wood cabinets; and glass-fronted bookcases that have been shut for too long. (I’m a ‘ghost” at heart, I guess. )” If someone marketed a perfume with those words alone, I would buy it. I’ve had someone describe their experience of Tam Dao to me as “a wooden attic in a country house, full of leather-bound books, which hasn’t been touched or aired in forever, with a beam of light falling in, highlighting the swirling dust particles.” Comes close, no? I don’t get that from Tam Dao, personally – but you never know. Someone else might. Miss K: whenever I need such a “fix”…I head to the Nordic Heritage Museum here in Seattle! (especially in winter)…the rooms are musty, filled to the brim with bric-a-brac, old costumes, flags, etc..
Kevin, I am curious to know which one you will choose, Baume de Doge or this? BdD is on my list, neck and neck with Frapin’s Caravelle Epicee. Thanks for the great review. SarahBeth: you’re welcome…and still awaiting a new sample of BdD to test alongside CN Homme. Maybe I’ll add a footnote later when the purchase is made…. RICK: If memory “serves”…they are just too close to need both..we shall see though. Rick/Sarah: I don’t think there’s a perfume line in existence that I’d want everything they make! Let me think.. I am sure I must be able to come up with one! Hmmm, okay you are right I can’t. Great review Kev. I happen to like a few other CN scents besides the Homme. I never thought of this and BdD being similar, but I JUST happen to have a sample on my desk at work ( go figure HA! ) and YES they do have similar aspects. I prefer the CN over the BdD when push comes to shove. C: I enjoy them both…but you know memory…must try side by side…AGAIN with the BdD…I’ve gone thru so many samples of that. P.S., C: you know YOU’RE the one who sent me my first sample of CN Homme…so thanks. EdI’s Bois D’Ombrie will be one of my fall purchases. Rictor: that is a great perfume, too. Hey Kevin, thanks for the review! The list of notes made me think of FM Noir Epices but, of course, notes don’t always mean much. Would you say the two as similar at all? Abyss: if I’m remembering correctly I didn’t like Noir Epices…I remember it as more “floral” that this one, and more carnation-y to boot…but have not smelled it in years. Kevin, It’s funny Abyss stated that, because I remember being so *anxious* to try Doge after your review, getting a sample in person in Aedes one Christmas, and then only a few days later wearing a sample of Noir Epices and realizing it was everything I wanted Doge to be (a zesty orange pomander). The fact that it has geranium to boot has made NE one of my favorite scents, though I like Doge too for more subtlety. Thanks Kevin, for another tantalizing review! What a great review, Kevin- thank you! You definitely have a flair for descriptive prose. I love your description of the cinnamon as ‘as if the spices had been stored too long in a wooden box and had solidified or were absorbed into the wood itself’…delicious. Also, ‘I’ve always loved the smells of dusty attics, the insides of old trunks and wood cabinets; and glass-fronted bookcases that have been shut for too long. (I’m a ‘ghost” at heart, I guess. )’ – I am a ghost at heart as well and will be hunting this one down for myself, I think. Thanks again! With a name like FragrantWitch how could you NOT like attics, trunks and the like!? Hey Kevin, great review! I caved snd bought a bottle of this and I’m glad I did. For some reason though within the first 30 minutes of wearing it a few people have commented that I smell like coconuts! Don’t know where that’s coming from but seeing that I like coconut smells anyway I’m not complaining. Ross: I guess in a very abstract way I can sense toasted coconut flesh (crisp, golden around the edges, vanillic) in the amber base…. Now I want a coconut gelato…. I had a similar experience with Ninfeo-Mio, it smelled like coconut (initially akin to Creed’s Virgin Island Water). Later I realized it was FIG I was experiencing. When I first smelled the scent, it got me thinking of another recent Ropion fragrance, Frederic Malle Geranium Pour Monsieur….. Not that they smell very alike ( that mint in the GPM makes the whole thing smell like mint flavored barf on me, gross I know), but like they’re part of the same tribe? All in all, I prefer the Homme more, but I don’t see a bottle in my future…. Kevin, as I said above, I do like Baume du Doge also, and I’ll be curious to try CN Homme. Your review makes it sound really nice. I feel I already have a couple of scents in the cardamom/clove/wood family, but it’s nice to smell others. As Sarahbeth mentioned, Caravelle Epicee is another nice one. Just FYI, 100ml is available for about $115 at a few etailers, making it practically equivalent in price to the Eau d’Italie.